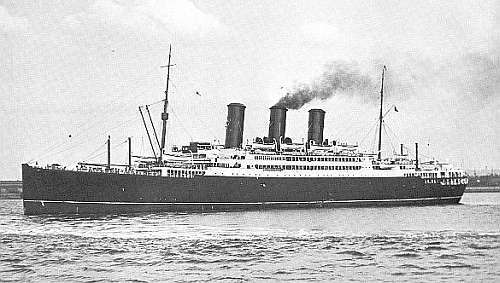 The Secretary of the Admiralty regrets to announce that the Armed Merchant Cruiser H.M.S. Scotstoun (Captain S. K. Smyth, R.N.) was sunk on Thursday by a U-boat. Two officers and four ratings are missing, and it is feared they have lost their lives. The next of kin have been informed.The remainder of the officers and ship's company have been landed at a British port. Graphic stories of the sinking of the Scotstoun were told by the survivors yesterday after they had been landed at a British port. The Scotstoun which was formerly the Anchor liner Caledonia 17,046 tons went down with her gunners standing up to the waist in water firing her guns to the last and holding the shells above their heads to load the guns. After the explosion the vessel was unable to make any headway and was an easy target for the submarine. Most of the crew rushed on deck and this fact was responsible for the saving of most of their lives. Many of the crew of about 350 are west of Scotland men and they were in cheerful mood when they passed through port yesterday in spite of their experience. It was early on Thursday morning that the torpedo struck. An S 0 S was immediately sent out though the wireless was damaged. In response a British reconnaissance aeroplane appeared and dropped a flare. The crew took to the lifeboats and a motor-launch was upset her occupants being thrown into the water but they were picked up by the other boats. Members of the crew said that the liner began to sink by the stern but the gun crew continued to try to sink the submarine the periscope of which was visible about 250 yards away. After the survivors had pulled away from the Scotstoun they saw her take her final plunge her bow high in the water and her single funnel cracking off " like a carrot". Most of the men were scantily dressed when they landed but some had been supplied with jerseys and canvas slippers by the crew of the rescuing warship. Earlier in the war the Scotstoun was relieved on one of her patrols by the Rawalpindi which was shortly afterwards sunk by the Deutschland.